In this era, known as the Kali Yuga, the best path to God is through love and devotion. Bhakti, or love, is the easiest and most natural way to God. The path is called the religion of Divine Love. Divine Love is nothing less than the immortal bliss of freedom itself, which comes unsolicited from God. Once realized, the individual is freed from grief and hatred, and lives in complete enjoyment of the bliss of God. With Sanskrit text, word by word meaning, English rendering of the text and elaborate explanatory and critical notes. Sri Ramakrishna encouraged his devotees to learn devotion through Narada's way. 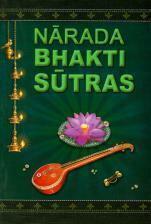 The Narada Bhakti Sutras are written with commentary by Swami Tyagishananda in the Ramakrishna Order. The book shows the way to devotion.